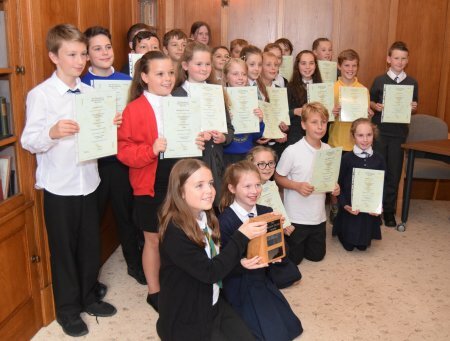 In 2018, 360+ children from nine primary schools participated, though only eight were able to compete for the trophy at the Soutar House on Friday, 28th September (Oakbank were at Dalguise). The finalists were: Abernethy (Iona Blues, Anna Smith); Balhousie (Deni Gesheva, Natalia Scigany); Craigclowan (Nisha Berry, Rosie Shaw); Craigie (Cavan Ramsay, Jayden Donald); Kinnoull (Lily Fraser, Kirsten Kelly); Moncreiffe (Tess Findlay, Callum Blair); Oakbank (Robyn Haggart, Archie Perkins - neither present); Tulloch (Kayla Rae, Madison Parsons); and Viewlands (Alistair Milne, Iain Jordan). All children qualifying as finalists, plus reserves, received certificates. Standards were again excellent and all the competitors were warmly commended by the judges. The William Soutar Trophy was won by Iain Jordan of Viewlands (The Wind); second place went to Kirsten Kelly of Kinnoull, (The Lowpin Match); and third was Nisha Berry of Craigclowan (Bawsy Broon). Our picture shows winner Iain Jordan holding the Soutar Trophy in front of the Soutar House, accompanied by fellow competitors. Second placed Kirsten Kelly and third placed Nisha Berry are both in the back row, far left and 6th from the left respectively. Many thanks to Jim Mackintosh for the image. Press coverage was supplied by the Courier and Perthshire Advertiser. STV News screened a report on Monday, October 1st. In 2017, 400+ children from ten primary schools participated, though only nine were able to compete for the trophy at the Soutar House on Friday, 29th September (Oakbank were at Dalguise). The finalists were: Abernethy (Lauryn MacNeill, Anna Smith); Balhousie (McKenzi Payne, Natalia Scigany); Craigclowan (Eve Bergin, Carmen McDermott); Craigie (Blyth Brown-Swankie, Neave Wilson); Kinnoull (Keir Chalmers, Amy Johnstone); Moncreiffe (Jenna Evans, Ben Marshall); Oakbank (Amy McVean, Sophie Saunders - neither present); Ruthvenfield (Alasdair Dawes, Jessica Napier); Tulloch (Lucy Martin, Dorian Siembida); and Viewlands (Marcie Allan, Charlotte Roach). All children qualifying as finalists, plus reserves, received certificates. Standards were again impressively high and all the competitors were warmly commended by the judges. The William Soutar Trophy was won by Dorian Siembida of Tulloch (Bawsy Broon); second place went to Lucy Martin, also Tulloch, (The Lowpin Match); and third was Blyth Brown-Swankie of Craigie (Bawsy Broon). Our picture shows winner Dorian Siembida holding the Soutar Trophy, accompanied by fellow competitors. Second placed Lucy Martin and third placed Blyth Brown-Swankie are both in the front row, 2nd from the left and 2nd from the right respectively. Many thanks to Elliott Boyle for the image. Press coverage was supplied by the Courier (October 2nd) and Perthshire Advertiser (October 6th). An online report was carried by the Scots Language Centre. 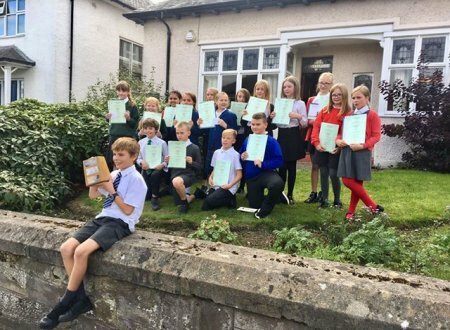 In 2016, children from six primary schools competed for the trophy at the Soutar House on Friday, 30th September. Balhousie were represented by Dawid Koprowski, Siobhan McCann, Ceilidh Meiklem and Lewis Scott. Defending champions Craigie entered Sam Duncan, Imogen Moore, Bruno Nowrotek and Erin Wylie. Kinnoull selected Emma Cormack, Finlay Jarvis, Ruby McAlpine and Hannah Stewart. Moncreiffe picked David Lidstone, Leah Menzies, Maya Shahrokhi-Moghaddam and Jamie Yellowley. Oakbank fielded Niall Crole, Struan Davie, Agne Stasyte and Nicole Wright. Viewlands went with Marcie Allan, Taylor Coleman, Rory Dent and Charlotte Roach. All the children (those present, plus reserves) received certificates. Standards were exceptionally high and the judges faced a difficult choice. The William Soutar Trophy was jointly won by Leah Menzies of Moncreiffe (The Wind), and Charlotte Roach of Viewlands (Bawsy Broon). A whisker behind were Emma Cormack of Kinnoull (The Wind), Finlay Jarvis of Kinnoull (Aince Upon A Day), Struan Davie of Oakbank (Wha Steers) and Rory Dent of Viewlands (Aince Upon A Day), all of whom were highly commended by the judges for their recitals. Our picture shows joint winners Leah (on the left) and Charlotte with the trophy inside the Soutar House, accompanied by fellow competitors. Many thanks to Elliott Boyle for the image. 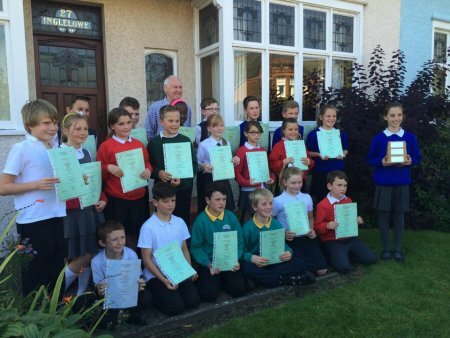 In 2015, children from five primary schools competed for the trophy at the Soutar House on Friday, 2nd October. Abernethy fielded Jasmine Kirk, Hamish McElnea, Cerys McGroarty and Adam Pilgrim. Balhousie were represented by Reece Devine, Siobhan McCann, Shoena Memia and McKenzi Payne. Craigie's selection was Beth Davidson, Callum Innes, Olivia Laing and Callum Watson. Defending champions Kinnoull entered Alex Douglas, Finlay Jarvis, Rose Ryan and Brodie Scott. Moncreiffe picked Callum Dalziel, Tommy Macrae, Jemmi-Lee Ross and Doug Yellowley. All the children received certificates. Standards were again very high and the William Soutar Trophy was won by Beth Davidson, a P7 pupil at Craigie Primary, for what the judges described as a sensitive interpretation of The Lowpin Match. The judges also highly commended Hamish McElnea (Bawsy Broon), Shoena Memia (The Drucken Fuggie-Toddler) and Brodie Scott (Aince Upon a Day). Our picture shows Beth with her trophy outside the Soutar House, accompanied by fellow competitors with Friends' chairman Iain Mackintosh at the rear. Many thanks to Elliott Boyle for the image. 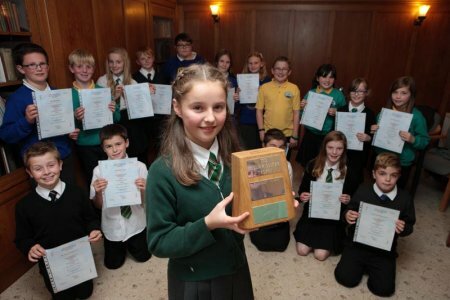 In 2014, children from four primary schools competed for the trophy at the Soutar House on Friday, 3rd October. Craigie were represented by Keir Barbary, Mila Guest, Jack Milne, Freya Stephen and Thomas Sutherland. Kinnoull's team was Georgia Douglas, Kirsty Harvie, Rory McGuire, Poppie Mackenzie and Carla Rourke. Last year's winners Moncreiffe fielded Cara Collin, Joseph Devine, Sheridan Leslie, Hannah Scarborough and Doug Yellowley. Strathallan entered Tom Forbes and Morgan Patterson. All the children received certificates. Standards were impressively high and the William Soutar Trophy was won by Carla Rourke, a P7 pupil at Kinnoull Primary, for what the judges described as a bravura performance of Bawsy Broon. Our picture shows happy competitors surrounding Carla with her trophy. Many thanks to freelance photographer Phil ("The Photo") Hannah of Almondbank, Perth who attended the prizegiving ceremony and supplied the image. One of William Soutar's wishes was that his collection of Bairnrhymes would be used in primary schools to keep the Scots tongue in regular use. 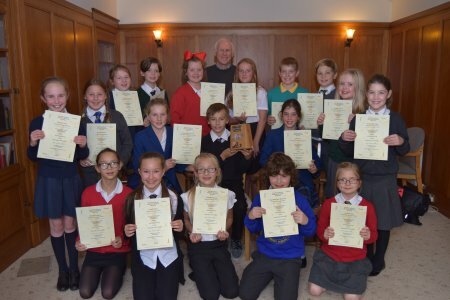 During the 2012-13 session, Willie Oliphant, assistant headmaster at Moncreiffe Primary School in Perth, took on the project of teaching some of the poems to P5 and P6 pupils. Materials were provided by Heather Reid and Deborah Trayhurn, both members of the Friends committee. Deborah is a talented artist and illustrated the booklet of poems, which may be downloaded from our schools page. A competition was held for the 12 best reciters in June 2013. P5 entrants were Joseph Devine, Niamh Baker, Struan MacLean, Lucy Angus, Cameron Terras and Jack Martin. P6 pupils were Josh McMillan, Megan Boyes, Bethia Davidson, Skye Cameron and Lewis Ledgerton. 3rd prize went to Struan MacLean; 2nd prize to Niamh Baker; and 1st prize was won jointly by Skye Cameron and Bethia Davidson. All the participants received certificates. 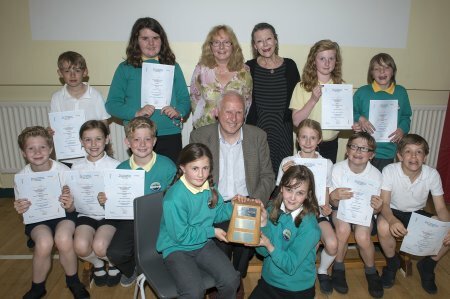 Happy finalists and winners of the inaugural Bairnrhymes Competition, held in Moncreiffe Primary School, Perth, on 20th June 2013. Joint first prize was won by Skye Cameron (left) and Bethia Davidson (right), both of P6, pictured holding the trophy. Iain Mackintosh, chairman of the Friends is seated centre, and judges Heather Reid and Deborah Trayhurn (who illustrated the poems) are in the centre of the back row. 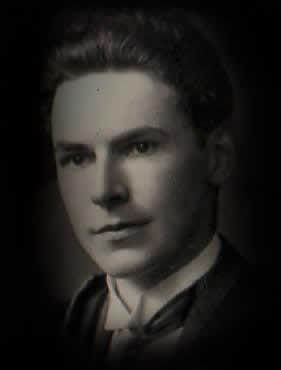 Picture by Angus Findlay and reproduced by kind permission of the Perthshire Advertiser. Membership of FoWSS is free, and you have the opportunity to organise or participate in projects designed to promote Soutar and his works. In addition, members receive an annual newsletter, notification of all FoWSS events and publications, and are invited to an annual Soutar Tea held at the Soutar House. Please use the Contact page if you would like to find out more about FoWSS.